This year Christmas is going to be filled with traditional sweets at our home. Those who have been following Hilda’s Touch of Spice closely must have taken notice by now…I hope you enjoyed making the Special Traditional Goan Sweets – Baath Cake (Semolina & Coconut Cake), Neurios(Crescents filled with fresh Coconut & Goa Pyramid Jaggery), Neurios (SweetPuffs with Dessicated Coconut),Kulkuls, Kormolas, Roce Cookies, Bolinhas (Goan cookies/biscuits), RichChristmas Fruit Cake as much as I did.. I know these were laborious & time consuming but it’s good to keep the tradition alive & bring in the traditional Christmas spirit. I’m happy that I could bring to you some easy & simple modern treats as well for those who love making sweets at home inspite of having busy work schedules. Many of you loved the recipes I posted last year – Marzipan, Christmas Milk Cream, Jujubes, Nan Khatai. I’m glad many of you tried out my new posts which were quick & easy to make – ChocolatePistachio & Apricot Fudge, Christmas Fudge. 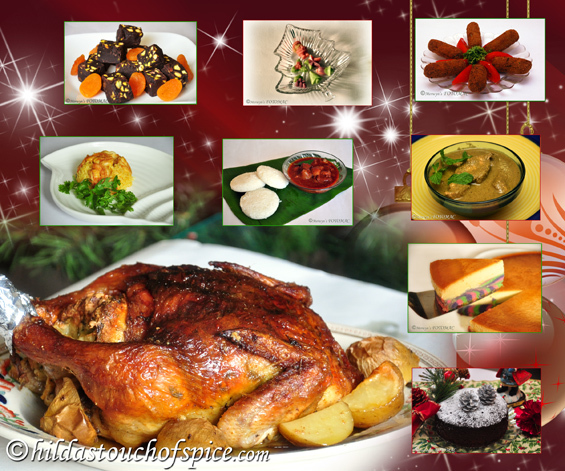 Since Christmas is celebrated through the week & lasts even after New Year’s Day till the 6th of January, I will continue posting some more recipes which you could try out & enjoy with your family & loved ones. Besides, you could include the other specials & relish throughout the festive season… Goan Specials like Beef Roast, Quick Chicken Roast, Clams in Green Coconut Masala (Teesreo), Goan Crab Masala, Goan Pomfret Rechado, Goan Pork Sausage Pulao, Chicken Xacuti, Goan Roast Beef Chilli Fry, Mince Potato Chops, Pan Fried Masala Fish (Mackerals), Pan Fried King Fish, Pomfret Caldinho, Prawn Rissoles, Shark Fish Ambot Tik, Squid Ambot Tik, Fish Vindaloo, Green Fish Curry, etc. You could also consider some tasty & delicious appetizers/starters to go with your cocktails & mocktails… ButterflyPrawns, Chicken Chilli, Chicken pate with Crackers, Chicken Satay, Chilli CheesePakoras, Corn & Oregano Cheese Balls, Creamy Chicken Kabab, Fish Chilli Dry, Fish Cutlets, Goan Stir Fry Prawns, Grilled Fish with Bell Peppers, Mini Savory Baskets.